WEST Belfast motorists can expect a further year of traffic gridlock as the finish date for the ambitious Belfast Rapid Transit (BRT) system has been delayed until 2018, we can reveal. The BRT was expected to be fully operational by autumn 2017. But continuing cutbacks at the Department for Regional Development – currently without a minister after the resignation of the UUP’s Danny Kennedy – have led to the completion date being put back 12 months. Plans for the £100 million BRT system were announced in May 2014. The system will connect West and East Belfast and the Titanic Quarter via the city centre. The route will incorporate Divis Street, the Falls Road and Andersonstown, while there’ll be a park-and-ride facility for the Colin area. There has been regular gridlock as work continues on BRT routes on the Falls Road between the Grosvenor Road and Whiterock Road. Work was due to start on the the BRT route on Divis Street/ Falls Road between Millfield and Grosvenor Road later this month. 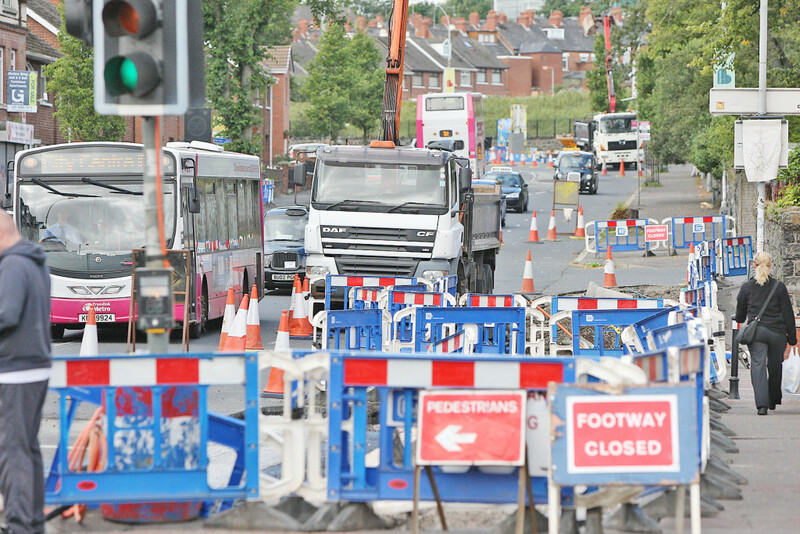 There are fears that the abandonment of roadworks during the lengthy delay will bring more traffic chaos and even that the project could be scrapped. West Belfast MP Paul Maskey said the news was “disappointing”.